This time I didn’t even realize it. I read another celebrity written novel, this one chosen solely on the merits of its very interesting cover art. (My first blog post about celebrity authors was The Wishing Spell by Chris Colfer.) This time, the celebrity author is Colin Meloy of the folk-rock group The Decemberists, and the illustrator is his wife Carson Ellis, the “illustrator in residence” for the band. Looking at Carson Ellis’ website, I realized she had illustrated The Mysterious Benedict Society series by Trenton Lee Stewart, which I loved – the drawings and the story. 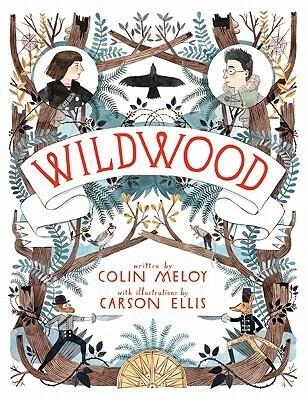 The novel is titled Wildwood, and it is the start of a fantasy series aimed at middle grade kids. Ok, now I need to back track a bit. I didn’t sit down and read this story, I actually listened to the audiobook, which was read by the amazing Amanda Plummer. I wish I had read it – I would have seen more of Ellis’ charmingly rustic drawings. Wildwood is a fantasy tale, drawing on many fantasy archetypes and plot devices. There is a stolen child. There is a character with a secret about their birth. There is a quest, and an animal friend (or two or three). There is magic, plus an evil witch. When I first started listening to the novel, my first inclination was to classify this story as Labyrinth (the movie) meets The Chronicles of Narnia. And that’s pretty accurate, but add an overlay of Portland west coast hipster. There’s no Turkish delight á la The Lion, the Witch, and the Wardrobe. Instead, the main characters of Prue and Curtis munch on gorp while hiking through Wildwood. Prue eats squash dumplings while an animal companion tries lentils and greens. Prue rides a fixed gear bike and looks at vinyl records. These details were amusing, creating the hipster vibe. The plot is fairly simple: Prue’s baby brother is stolen, and she goes after him into the woods – the I.W. – the Impassable Wilderness. Prue is followed by a classmate, Curtis. While in the woods, they are discovered and chased by a group of militarily dressed coyotes who capture Curtis. Prue manages to escape, and travels to Southwood to appeal to the government for help to rescue her brother and Curtis. Bureaucracy and then downright fascism lead to Prue escaping Southwood to go on a quest to consult the Mystics of Northwood. Meanwhile, Curtis enlists in the coyote army, which turns out to be the force of Alexandra, the evil Dowager Governess of Wildwood. Curtis quickly realizes he’s signed onto the wrong team. Prue and Curtis finally meet up again as they help the citizens of Wildwood, both animals and human Bandits, form the Wildwood Irregulars in order to defeat the Dowager Governess. A few plot details sat uneasily with me. Prue’s parents are strangely absent, delegating much of the baby brother’s childcare to Prue, and then later in the story, they are strangely acquiescent to Prue’s decision to return to the wood. I also was uncomfortable with Curtis’ decision at the end of the story (I am trying not to give away spoilers here). I also found myself wondering how coyotes held their Napoleonic rifles without opposable thumbs. I think this means I wasn’t engaged enough to suspend my disbelief involuntarily. Aside from these minor distractions, Wildwood is an entertaining story with much to recommend it – interesting magic and lore, a charming blend of mundanity and fantasy, and very likable main characters. The west coast quirks add to the enjoyment, and I will be looking forward to the next installment – this time in print, so I can enjoy Ellis’ illustrations.